The Radisson Blu Royal Hotel Copenhagen is located near a variety of attractions, including Tivoli Gardens, Rosenberg Castle, the National Museum and Stroget shopping street. There are also many cafes and restaurants situated in the area near the hotel. A variety of entertainment venues can be found in the local vicinity as well. 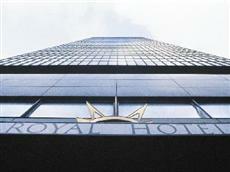 The main train station is situated just a short distance from the Radisson Blu Royal Hotel Copenhagen. The airport is also located within a short distance. Parking is provided at the hotel for the use and convenience of guests with cars. Public transportation services are available in the city. There are 260 guestrooms at the Radisson Blu Royal Hotel Copenhagen. Each room features amenities such as coffee and tea making facilities, mini-bars, a separate sitting area, satellite television, high speed Internet access and private baths. Non-smoking rooms are available at the hotel. Amenities offered at the Radisson Blu Royal Hotel Copenhagen include a café on site, bar, meeting spaces, sauna and fitness center. The hotel also offers 24 hour room service and massage treatment services.